Moments before taking my second child home from the hospital in 2013 I had a panic attack. Doctors rushed in, oxygen was given. My left eye swelled shut and I was quarantined. What was going on? Nevermind my body was completely rejecting me, how was I going to survive with another baby? I had two stepkids, a creative business, how was I going to do it all? This was me: mom, stepmom, wife, female entrepreneur, mid-30-something, creative, the list goes on. The pressure of being perfect at all of these roles was overwhelming. I was exhausted. I had lost my inner being, my authentic sense of self. My body literally stopped me in my tracks. It took a team of doctors, two life coaches, a Buddhist monk to finally surrender my perfectionism. Here’s a sliver of my story: In 2009 I married a man with two boys who were 4 and 7 years old. I also started my first business, Step Brightly Creative. I was a designer, creating websites for stationery businesses, designing books for powerful women leaders, launching businesses into the world with perfect attention to detail. I was paid, in essence, to deliver perfection, and I was really good at it! My business was thriving. I took that perfectionism right into my marriage and new role as a stepmom. And failed royally. I was an automatic mother with zero experience being a wife or mom. On the outside, you’d never know. I kept up the facade of perfection on Instagram, in my business, never letting on the internal overwhelm that came with being a stepmom or new wife. Sound exhausting? It was. Years later, my body said No. Stop. After deep reflection, I realized the panic attack, and what turned out to be stress-induced shingles (at age 37!!) was God’s gift to kill my perfectionism and surrender. Surrender to what? Good Q. Surrender and become the leader of my life. Shedding the cultural roles society places on working mothers, and instead, declaring what motherhood, business and career and most importantly self-love means to me. I hired a life coach to help me define what “having it all” meant to me. 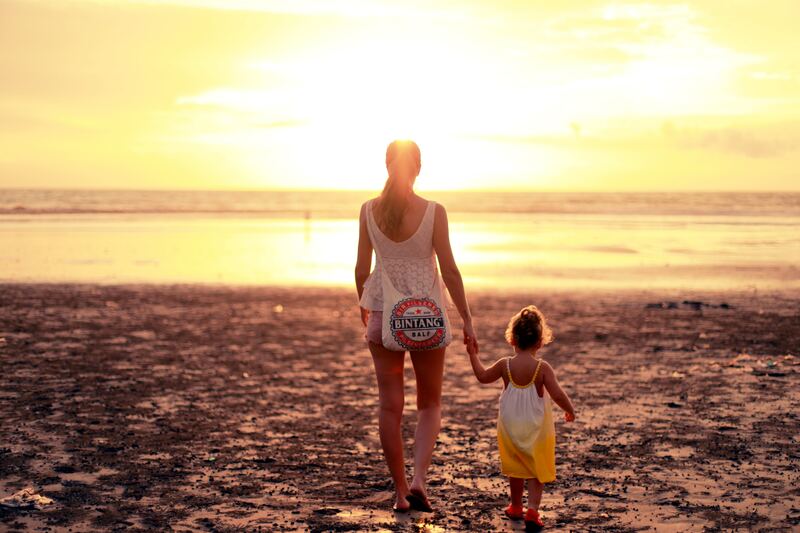 I surrendered my perfect mom role, it wasn’t real to begin with. I defined what love and delight looked like for me and searched for it in everyday moments. I didn’t have to do anything, I could just smile and be in the presence of love with my family. I sought peace. I made it a priority to mediate weekly with a Buddhist monk. I knew meditating on my own would never work (my ego is too shifty) so I scheduled a meditation appointment like I would any client meeting. I surrendered and asked for support. I hired full-time daycare, a housecleaner, I ordered groceries through a delivery service and hired a designer and developer to help with my business. I gave up trying to be organic about it all, and I asked my husband to divide up the chores in a healthy and equal way. I focused on self-love instead of performance. Who was I trying to be perfect for anyways? As leader of my life, I am my biggest asset, I surrendered to taking care of me first, as self-care is not selfish, it’s a priority. “Having it all” looks different for every mother. Know that this is your life, you only have one, how you choose to fill your days, your mindset, and who you are being about it “all” is your choice. Be you, be the leader of your life. Lisa Guillot is a brand strategist and professional life and leadership coach in Chicago, with international clientele. Dubbed a branding expert by the Chicago Tribune, Lisa brings heart, soul, and action to every conversation. She delivers her brand strategy and leadership coaching to motivated entrepreneurs and executives through one-on-one coaching, intensives and workshop settings. On top of her coaching practice, Be Bright Lisa Coaching, Lisa is the founder of Step Brightly, a boutique brand consultancy, and co-founder of Forth Chicago a women’s entrepreneurial community.